Juan Luis Morera Luna (born December 19, 1978), best known as his stage name Wisin, is a Puerto Rican reggaeton rapper, singer and record producer, best known as a member of the reggaeton duo Wisin & Yandel. He released his first solo album El Sobreviviente in 2004, and ten years later, in 2014, his second solo studio album, El Regreso del Sobreviviente was released. Wisin is currently working with Prince Royce on their Power and Love tour. Wisin met Yandel in school. They began performing as a duo in the late '90s and made their album debut in 2000 with Los Reyes del Nuevo Milenio. They later made the jump to a major label in 2003 with Mi Vida... My Life, their first for Universal subsidiary Machete Music. Pa'l Mundo then catapulted them to mainstream success in 2005. Subsequently, Wisin & Yandel established their own label, WY Records, and presented an affiliate group, Los Vaqueros. In November 2013, after the duo's Líderes tour, the duo went into hiatus, but although rumors saying their split was because of differences between them, Yandel denied those rumors and confirmed they're not disbanded. Wisin & Yandel reunited in 2018 and released their tenth studio album after spending 5 years apart. The new album is called "Los Campeones del Pueblo / "The Big Leagues." On July 11, 2018, Telemundo announced Wisin as a coach on La Voz (U.S.). Wisin joins Luis Fonsi, Carlos Vives and Alejandra Guzmán as coaches on the Spanish-language version of NBC singing-competition The Voice. Wisin is married to Yomaira Ortiz Feliciano. The couple married on July 26, 2008 in Wisin's hometown of Cayey, Puerto Rico after four years together. They have two children, Yelena, born (2007-09-27) September 27, 2007 (age 11) and Dylan Luna, born (2009-07-19) July 19, 2009 (age 9) and Victoria, born on August 29, 2016 with Patau syndrome, but died on September 30 from the disease. "Todo Comienza En La Disco"
"Si Me Das Tu Amor"
"—" denotes a title that did not chart, or was not released in that territory. "Si Una Vez (If I Once)"
"Al Filo de Tu Amor (Remix)"
The following songs are not singles or promotional singles and have not appeared on an album by Wisin. David Impelluso Himself An autobiographical documentary focusing on Wisin & Yandel's life. ^ Gomez, Shirley (July 18, 2017). "Richest Reggaeton Artists: 15 Urban Music Singers with Fat Bank Accounts and Fit Bodies". Latin Times. Newsweek Media Group. Retrieved September 24, 2018. ^ Birchmeier, Rovi, Jason. "Wisin – Biography". Billboard. Retrieved December 4, 2014. ^ "El adiós de Los Líderes". Milenio. Retrieved December 12, 2014. ^ "Yandel Bio". MTV. Retrieved December 12, 2014. ^ "Yandel Denies Reggaeton Duo Will Be Breaking Up". Cosmopolitan. Retrieved December 16, 2014. ^ "Wisin Takes the Third Coach Chair For Telemundo's 'La Voz' (The Voice)". Billboard. Retrieved 2018-10-22. ^ "Wisin se casó en Puerto Rico". People en Español. Retrieved December 12, 2014. ^ "Nace hijo de Wisin". People en Español. Retrieved December 12, 2014. ^ "Puerto Rican rapper Wisin reveals one-month old daughter has died". 2016-09-30. Retrieved 2016-09-30. ^ "Wisin – Chart history (Billboard 200)". Billboard. Retrieved December 12, 2017. ^ "Wisin – Chart history (Top Latin Albums)". Billboard. Retrieved December 12, 2017. ^ "Wisin – Chart history (Top Rap Albums)". Billboard. Retrieved December 12, 2017. El Sobreviviente: "Latin Rhythm Albums: Week of February 17, 2007". Billboard.biz. Retrieved December 8, 2014. El Regreso del Sobreviviente: "Latin Rhythm Albums: Week of April 5, 2014". Billboard.biz. Retrieved December 8, 2014. El Regreso del Sobreviviente: "Ranking mensual: Marzo 2014 – CAPIF" (in Spanish). Cámara Argentina de Productores de Fonogramas y Videogramas. Archived from the original on April 16, 2014. Retrieved December 8, 2014. El Regreso del Sobreviviente: "Top 100 México – Semana Del 10 al 16 de Marzo 2014" (in Spanish). Asociación Mexicana de Productores de Fonogramas y Videogramas. Archived from the original on April 4, 2014. Retrieved December 8, 2014. ^ "Gold & Platinum". RIAA. Retrieved 2019-04-04. ^ "Wisin – Chart history (Billboard Hot 100 Charts)". Billboard. Retrieved August 2, 2017. ^ a b c "Search for charts: Wisin > Latin Rhythm Airplay". Billboard.biz. Retrieved April 10, 2015. ^ a b "Anahí Rumba Charts". Billboard. Retrieved 13 October 2015. ^ a b c * For "Desde el Primer Beso": "Gocho (feat. Wisin) – Desde el Primer Beso (Latin Pop Songs)". Billboard. Retrieved December 18, 2014. For "Muévelo": "Sofia Reyes (feat. Wisin) – Muévelo (Latin Pop Songs)". Billboard. Retrieved February 12, 2015. For "Me Marcharé": "Search for charts: Los Cadillacs > Latin Pop Airplay". Billboard. Retrieved April 10, 2015. For "Baddest Girl in Town": "Search for charts: Pitbull > Latin Pop Airplay". Billboard. Retrieved July 18, 2015. For "Rumba": "Anahí (feat Wisin) – Rumba (Latin Pop Songs)". Billboard. Retrieved October 13, 2015. ^ a b c * For "Desde el Primer Beso": "Gocho (feat. Wisin) – Desde el Primer Beso (Tropical Songs)". Billboard. Retrieved December 18, 2014. For "Fiesta in San Juan": "Assia Ahhatt (feat. Wisin) – Fiesta in San Juan (Tropical Songs)". Billboard. Retrieved December 20, 2014. For "Me Marcharé": "Los Cadillac's (feat. Wisin) – Me Marcharé (Tropical Songs)". Billboard. Retrieved March 28, 2015. For "Rumba": "Anahí (feat Wisin) - Rumba (Tropical Songs)". Billboard. Retrieved October 13, 2015. ^ "Search for charts: Wisin > Mexico Airplay". Billboard.biz. Retrieved April 23, 2015. ^ "Wisin discography – Spain Charts". Spanish Charts. Hung Medien. Retrieved December 9, 2014. "Nota de Amor": "Top 100". Record Report. R.R. Digital C.A. April 25, 2015. Archived from the original on April 23, 2015. ^ Peak chart positions for singles in France: "Ricky Martin dans les charts français" (in French). Hung Medien. Retrieved August 27, 2015. ^ Peak chart positions for singles in Switzerland: "Singles - Schweizer Hitparade". Hung Medien. Retrieved August 28, 2015. ^ "AMPROFON Certificaciones – Junio 2014" (in Spanish). AMPROFON. Retrieved December 9, 2014. ^ "AMPROFON Certificaciones – Septiembre 2014" (in Spanish). AMPROFON. Retrieved December 9, 2014. ^ "Top 100 Canciones – Semana 1: 29.12.2014 al 04.01.2015" (in Spanish). PROMUSICAE. Retrieved April 8, 2015. ^ "Wisin – Awards (Billboard charts)". AllMusic. Rovi Corporation. Retrieved December 8, 2014. ^ a b * For "Desde el Primer Beso": "Gocho (feat. Wisin) – Desde el Primer Beso (Hot Latin Songs)". Billboard. Retrieved December 18, 2014. For "Muévelo": "Sofia Reyes (feat. Wisin) – Muévelo (Hot Latin Songs)". Billboard. Retrieved February 12, 2015. For "Me Marcharé": "Search for charts: Los Cadillacs > Top Latin Songs". Billboard. Retrieved May 7, 2015. For "Baddest Girl in Town": "Search for charts: Pitbull > Top Latin Songs". Billboard. Retrieved June 19, 2015. For "Muévelo": "Sofia Reyes (feat. Wisin) – Muévelo (Mexico Airplay)". Billboard. Retrieved December 20, 2014. For "Muévelo": "TOP 100 CANCIONES + STREAMING: SEMANA 07: 09.02.2015 al 15.02.2015" (in Spanish). PROMUSICAE. Retrieved April 8, 2015. ^ "Top 100". Record Report. 14 November 2015. Archived from the original on 12 November 2015. Retrieved 8 January 2019. ^ "French Charts > EnriqueIglesias" (in French). lescharts.com Hung Medien. Retrieved 29 December 2011. ^ "Swiss Charts > Enrique Iglesias" (in German). Retrieved 29 December 2012. ^ "TOP 100 CANCIONES + STREAMING: SEMANA 12: del 16.03.2015 al 22.03.2015" (in Spanish). PROMUSICAE. Retrieved March 29, 2015. ^ "Nicky Jam / Wisin – Si Tú la Ves". Nicky Jam / Wisin – Si Tú la Ves – Elportaldemusica.es: Novedades y Listas Oficiales de Ventas de Música en España. Retrieved 2017-11-16. ^ "Top 100 Canciones – Semana 14: del 30.3.2018 al 4.5.2018" (in Spanish). Productores de Música de España. Retrieved April 11, 2018. ^ "Reik Feat Ozuna & Wisin – Me Niego". elportaldemusica.es (in Spanish). Productores de Música de España. Retrieved May 20, 2018. For "La Copa de Todos": "Wisin, Paty Cantu & David Correy – La Copa de Todos (Mexico Airplay)". Billboard. Retrieved February 12, 2015. ^ "Si Te Digo la Verdad (Official Remix) (feat. Gocho) – Single by Tito El Bambino". iTunes. Retrieved December 13, 2014. ^ "Tu Olor (Official Remix) (feat. Wisin) – Single by Tito El Bambino". iTunes. Retrieved December 13, 2014. ^ "Sistema (feat. Jory) – Single by Wisin". iTunes. Retrieved December 13, 2014. ^ "Creo en Mi (feat. Wisin) – Single by Natalia Jiménez". iTunes. Retrieved December 13, 2014. ^ "Nena Mala (feat. Wisin) – Single by Tito El Bambino". iTunes. Retrieved December 13, 2014. ^ "Yo Quiero Contigo – Single by Wisin". iTunes. Retrieved December 13, 2014. ^ "Los Reyes del Perreo – Album by Alexis & Fido". iTunes. Retrieved December 13, 2014. ^ "La Melodía de la Calle – Album by Tony Dize". iTunes. Retrieved December 15, 2014. ^ a b "Welcome to the Jungle – Album by Franco "El Gorila"". iTunes. Retrieved December 13, 2014. ^ "La Melodía De La Calle: Updated – Album by Tony Dize". iTunes. Retrieved December 15, 2014. ^ "El Momento – Album by Jowell & Randy". iTunes. Retrieved December 15, 2014. ^ "Franco de Vita Vuelve: en Primera Fila – Album by Franco De Vita". iTunes. Retrieved December 13, 2014. ^ "Santa Cos – Album by Cosculluela". iTunes. Retrieved December 15, 2014. ^ "Alta Jerarquía – Album by Tito El Bambino". iTunes. Retrieved December 15, 2014. ^ "The Last Don 2 – Album by Don Omar". iTunes. Retrieved 2015-12-31. ^ "El Protagonista – Album by Andino". iTunes. Retrieved 2017-12-31. ^ C. Gutierrez, Evan. "Mi Vida: La Pelicula – Wisin & Yandel". AllMusic. All Media Network. Retrieved January 3, 2015. ^ "Wisin & Yandel actúan con Dulce María". PeopleEnEspanol.com. Retrieved February 12, 2015. ^ "Wisin & Yandel Named Newest Coaches on 'La Voz…Mexico'". Billboard.com. Retrieved February 12, 2015. ^ "Nicky Jam Wins Big at Billboard Latin Music Awards: See the Full Winners List". Billboard. Retrieved 2019-03-19. ^ "Billboard Latin Music Award Winners 2018: Complete List". Billboard. Retrieved 2019-03-14. ^ "Ozuna Leads 2019 Billboard Latin Music Awards Finalists: Complete List of Nominees". Billboard. Retrieved 2019-03-14. 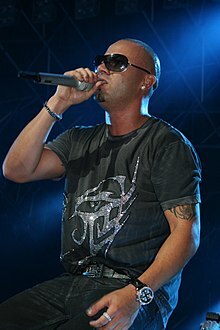 Wikimedia Commons has media related to Wisin.